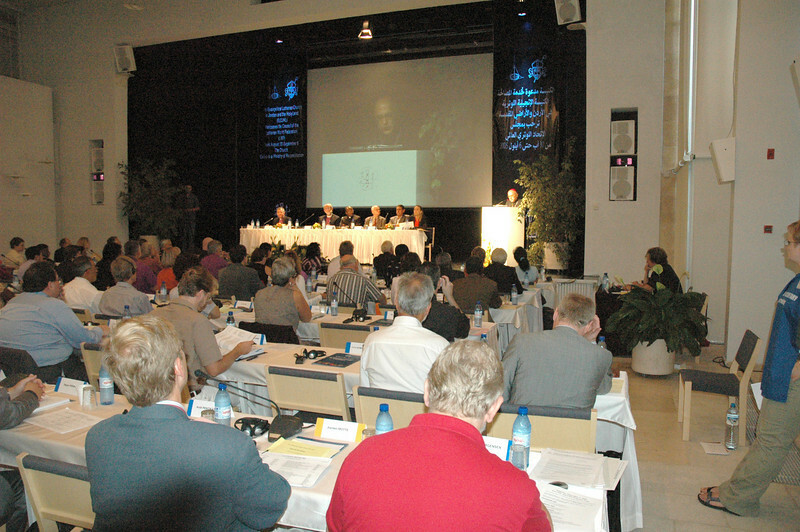 The Lutheran World Federation Council met Aug. 31-Sept. 6 in Jerusalem and Bethlehem. 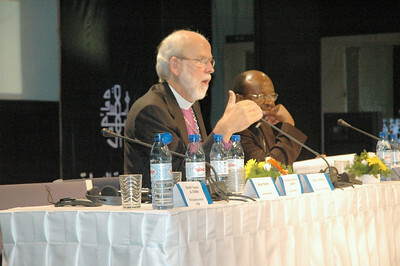 Bishop Mark Hanson, ELCA presiding bishop and LWF president, presided over the council proceedings. Bishop Mark Hanson, ELCA presiding bishop and LWF president, presided over the Aug. 31-Sept. 6 meeting of the LWF Council in Jerusalem and Bethlehem. Next to Hanson is the Rev. 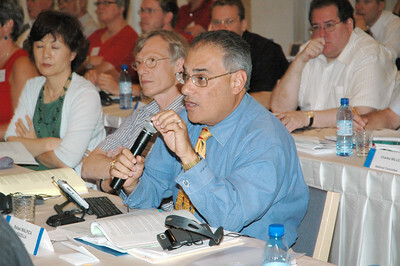 Ishmael Noko, LWF general secretary. The Rev. Mitri Raheb, pastor of the Christmas Lutheran Church, Bethlehem, addressed the Lutheran World Federation Council meeting Sept. 1. The International Center of Bethlehem, which shares space with the congregation, was the site of most of the council meeting. Some meetings were held in Jerusalem. The Rev. Barbara Rossing, second from right, is an ELCA pastor, faculty member at Lutheran School of Theology at Chicago and Lutheran World Federation (LWF) Council member. 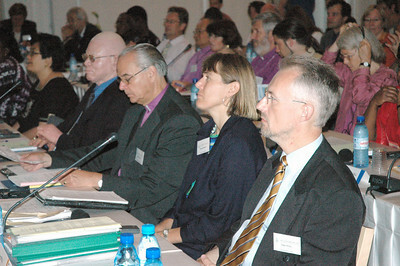 At right is Peter Stoll, LWF treasurer. 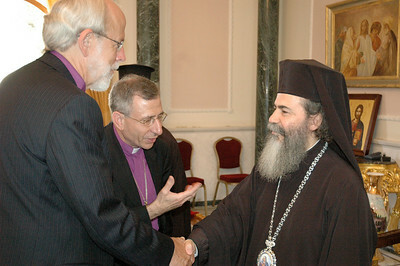 Left of Rossing is Bishop Christoph Klein, Evangelical Church of the Augsburg Confession in Romania and LWF Council member. The Rev. Rafael Malpica Padilla, addresses the Lutheran World Federation (LWF) Council meeting in Bethlehem. Malpica Padilla, executive director of the ELCA Division for Global Mission, is an LWF Council advisor. The council met in Jerusalem and Bethlehem Aug. 31-Sept. 6. 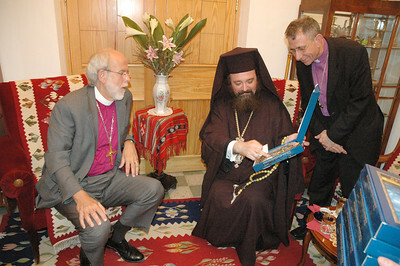 Bishop Mark Hanson, ELCA presiding bishop and LWF president, left, and Bishop Munib Younan, LWF vice president, right, met Sept. 1 with Archimandrite Ieronim Cretu, center, Patriarchal Representative of the Romanian Orthodox Church in Jerusalem. Archimandrite Cretu is showing the LWF representatives a locally made cross, containing natural elements from the Holy Land which he presented to Hanson and Younan. LWF Leaders lay a wreath Sept. 2 at the Children's Memorial at Yad Vashem, the Jewish peoples' memorial to the Holocaust in Jerusalem. 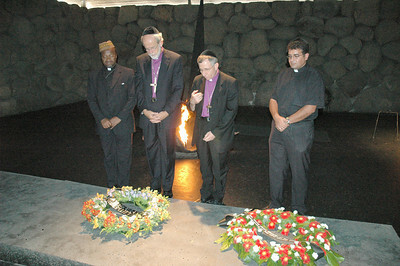 From left are Dr. Ishmael Noko, LWF general secretary; Bishop Mark Hanson, ELCA presiding bishop and LWF president and the Bishop Munib Younan, LWF vice president, and the Rev. 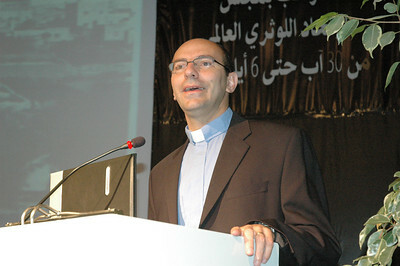 Ramez A'nsara, pastor of Evangelical Lutheran Church of Hope, Ramallah. Dr. Ishmael Noko, LWF general secretary, Bishop Mark Hanson, ELCA presiding bishop and LWF president, and Bishop Munib Younan, LWF vice president, met Sept. 2 with the newly elected Greek Orthodox Patriarch of Jerusalem, His Beatitude Theophilus III in the Old City of Jerusalem. Theophilus III was elected to his new post Aug. 22. 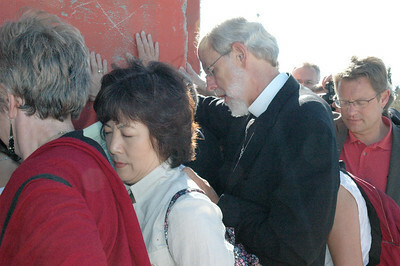 Bishop Mark Hanson, ELCA presiding bishop and LWF president, center, lays his hands on the Israeli separation wall in Bethlehem and prays. The LWF Council began its session on Sept. 6 with a Morning Prayer service at the wall.